A combination of some breaks in the clouds this morning, a potent disturbance tracking northeast and ample wind energy in the atmosphere aloft could help some strong thunderstorms to form around midday, mostly over the eastern FLX and CNY before heading east. Some additional severe thunderstorms may be possible towards the middle of the day on Tuesdayas a strong disturbance moves into the area and interacts with some modest instability and moderate winds in the upper levels of the atmosphere. The main limiting factor to thunderstorm development today will be the amount the atmosphere is able to ‘destabilize’. Atmospheric instability is what thunderstorms feed off of to grow and strengthen. However, while instability is a very important part of the thunderstorm development puzzle, moderate to even weak instability can still produce robust thunderstorms if the other conditions are favorable. Monday was a good example of this, with a strong to severe line of storms marching across the entire Finger Lakes region, despite lackluster instability. Once again today, it looks like there may be enough going on in the atmosphere that storms will be able to tap into even small amounts of instability to become strong. Furthermore, an area of broken clouds will slide across the Finger Lakes and into Central New York this morning. Already, at 7am, some instability is showing up in this area, and it will only increase as the sun rises higher in the sky this morning, heating the ground up through those breaks in the clouds. Two of the other most important keys to today’s severe weather set up are moderate winds aloft, which will help organize thunderstorms, produce hail, and possibly be brought to the surface as strong winds. The other important factor is a strong forcing mechanism to encourage storms to grow and strengthen, even with modest instability. This forcing mechanism is a potent disturbance in the atmosphere over western Pennsylvania this morning that will track northeast into the Finger Lakes. Thunderstorms should start to form along the front edge of this disturbance by the late morning hours over the central and eastern Finger Lakes. 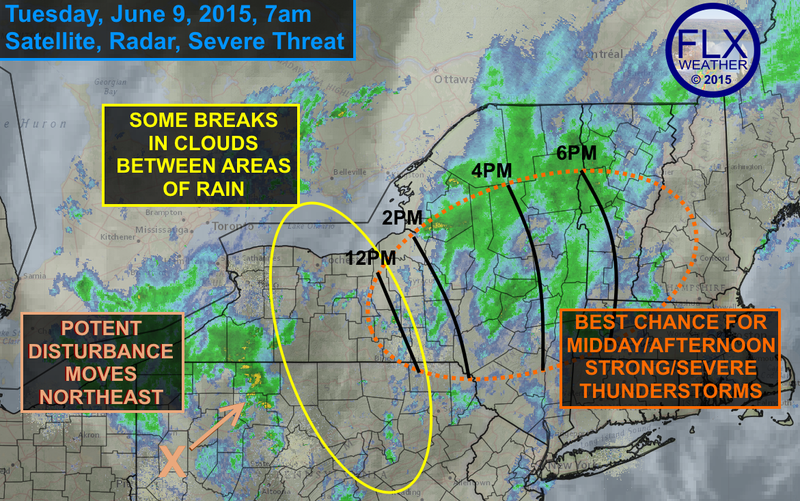 The storms will probably start off as individual cells or a broken line with a threat for some hail and gusty winds. As the storms track across CNY and into eastern New York, they will probably form some sort of a broken squall line with areas of damaging winds. The tornado threat today is next to nil, with winds all blowing the same direction throughout the different layers of the atmosphere. 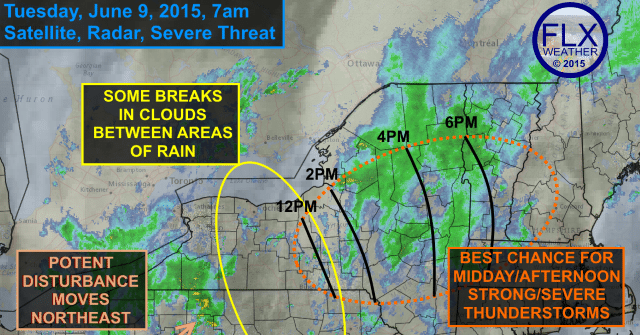 By early afternoon, most of the severe threat will be over for the eastern Finger Lakes. An area of steady rain will move through most of the region as the disturbance moves through.